Elements Skateboards is the biggest brand in the action sports industry. They make quality decks and offers skateboards completes at affordable prices. In this post, we take an in-depth look at the Elements skateboards and help you decide if they’re a good choice for you. 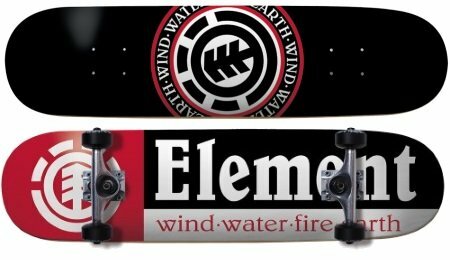 Element Skateboards was created in the early 90’s by Johnny Schillereff as a small collaborative company named Underworld Element in Atlanta. Underworld’s focus was on hip-hop urban culture, art, music, and design, bringing together and catering to numerous artists. The company, however, met serious challenges and had to fold. Johnny then re-launched the company around the skateboarding lifestyle under the name Element (without “Underworld”) and focused primarily on skateboard product development and marketing, and building a strong team of riders. Since those years, Element has moved to a creative space, The Branch, they created in California. The company grew fast to become one of the biggest skate and clothing brands in the world. Element Skateboards supports some of the best skaters in the industry. Its team includes skateboard legends such as Bam Margera, Ray Barbee, Mark Appleyard, Tom Schaar, Donny Barley, Nyjah Huston, Nick Garcia, Evan Smith, and many others. The Element logo, which represents Wind, Water, Fire, and Earth, is without a doubt one the most recognized in the industry. The Element brand is strong and has for decades survived the ups and downs of the industry. Element Skateboards makes technical skate decks and complete street skateboards, cruiser boards, skateboard wheels, and skate accessories. They also have a large and very successful clothing branch. Element’s complete skateboards offer good value for the money and are well-regarded in the skateboarding community. At under $100, you get an affordable setup with a good quality deck and decent components – including Element’s own trucks, wheels, and bearings. Elements Skateboards decks are made by PS Sticks (as of 2016), a renowned wood shop run by skateboard manufacturing expert Paul Schmitt and with facilities in the U.S and Mexico. In terms of quality, most skateboards consider Element decks equivalent to other high-end brands such as Baker, Real, Blind, Birdhouse, Enjoi, Almost etc. Element skateboard decks are made using either the company’s Thriftwood or Featherweight deck technology. The Thriftwood construction is an environment-friendly approach in which the wood layers are not dyed to reduce the amount of chemicals and improve recycling. The Featherweight approach uses thinner layers with stronger glue, resulting in a lighter deck with more pop. Element has also developed the Twig technology which builds on the Featherlight construction approach but results in an even lighter and snappier deck specifically designed for lightweight riders. So now we know who Element is and what they do. Let’s now turn our attention to some of their popular skateboards. The Element Section boasts a cool red, white and black theme with the Element brand and logo and the names of the four natural elements (wind, water, fire and earth) printed in red color on white background on the deck bottom. The Section comes three sized, 31.5″ x 7.5″ (14″ wheelbase), 31.5″ x 7.75″ (14″ wheelbase), or 31.75″ x 8″ (14.5″ wheelbase). This deck is built using the Featherlight construction, which as mentioned involves thinned wood veneers pressed with special glue for both lightweight and high strength. The Element Core trucks (4.75″ for the smaller deck or 5″ for the others) are lightweight and durable. The complete includes Element wheels with a 50″ diameter (for the 7.5″ deck) or 52″ (7.75″ and 8.0″ decks). The wheels have a medium durometer of 99A, which is well-suited for rougher terrain, pool, and beginner skatepark riding. They are easy to slide and give you more control than harder wheels – but are not so well-suited for advanced street tricks. See the Section reviews and price here on Amazon, or the Section Tie Dye version here. 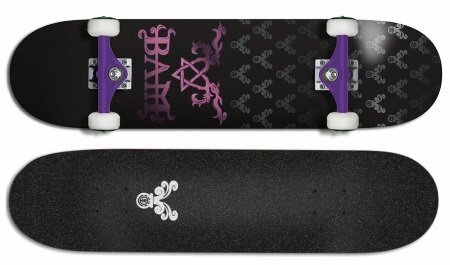 The Bam Margera Heartgram is 32″ by 7.75″ or 8″. The black version has pink a pink graphic with Bam’s name and a cool symbol-like pattern. This is a sturdy, Featherweight construction board with performance concave for extra flick. The Bam Heartgram comes by default with heavy duty Element Core 5″ aluminum trucks and 52mm Element Bam Heartgram printed wheels. See the 7.7″ version with stock components here on Amazon. Or you can go for a premium setup with Independent Stage 11 trucks and Ricta Sparx wheels – perfect for skatepark. The Bam Heartgram also comes in a pink color version (7.75″ or 8.0″). The Golden Hour is 31.25″ by 7.75″ (14″ wheelbase) or 31.75″ by 8″ (14.25″ wheelbase). It boasts colorful red and yellow graphics reminiscent of a sunrise or sunset, with the Element logo in a wide black circle in the middle of the deck. This deck has a mellow concave for versatile and easy skating. Like most Element skateboards, it’s made from 7-ply premium maple wood using the Featherweight construction process. The Golden Hour comes with rugged 5″ (or 5.25″ with the 8″ deck) raw polished Element alloy trucks and 52mm wheels for versatile street skating – tricks, cruising, park and pool. See it here on Amazon. The Sylvan has a beautiful design with 4 equal-length color quadrants with yellow, red, blue and green color shade backgrounds. Each quadrant contains the Element logo overlaid in white color on top of the background. This Sylvan is 31.25″ x 7.75″ or 31.75″ x 8″ (wheelbase 14″/14.25″). It comes with the usual 5″/5.25″ polished Element trucks and 52mm Element wheels. See the Sylvan here on Amazon. The Element Woke has amazing graphics and colors. A stylish black hand contains an eye-like shape in its palm with the Element logo in the eye. Replicated of the logo’s tree symbol extend at each of the 4 fingertips. The colors define 3 sections, a white area between the trucks (with the black hand on it), an orange section/black section on the nose and tail. Like many of the Element decks, the Woke comes in sizes 31.25″ x 7.7″ or 31.75″ x 8.0″, with 5″ or 5.25″ Element trucks and 52mm 99A wheels. See the Woke here on Amazon. The Element Feathers is by far my personal favorite board. It has bright and crisp colors with three different geometric patterns covering the tail, nose, and wheelbase in a symmetrical fashion. The orange, blue, red and white shades used for the rectangle, circular and triangular motives result in a beautiful overall impression. The black line around the deck also adds to the stunning and energetic visual impression this design creates. The Element logo is printed in a blue circle right in the middle of this fusion of colors. The Element Feathers complete comes in the usual 31.25″ x 7.75″ or 31.75″ x 8.0″ deck sizes, with 5″/5.25″ Element polished trucks and 52mm wheels. Check out the Feathers complete skateboard on Amazon. 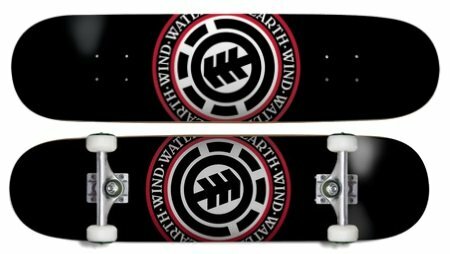 The Element Seal complete skateboard boasts an elegant and sober black background both on the deck ‘s top and bottom, with the Element logo circled by red lines and the names of the 4 natural elements. This deck’s art inspires respect and attracts the eye, particularly when ridder by a skillful skater! The Element Seal deck is a 7-ply maple deck made using the Featherweight technology resulting in a light and strong deck. In comes in Element’s standard sizes (7.75″ with 14″ wheelbase, 8.0″ with 14.25″ wheelbase), 5″/5.25″ trucks, and 52mm wheels. See the 8″ version with the stock Element setup here on Amazon. Alternatively, check out this premium setup with Independent Stage 11 trucks, Ricta Sparx wheels, and Amphetamine bearings. Element Skateboards offer good quality affordable complete skateboards with decent setups for (serious) beginners, skaters looking to cruise around a lot, and people getting back into skateboarding after a long break. The Element decks are high-quality and also well-suited for hard riding and tricks if you pair them with more advanced setups – e.g. Independent or Thunder trucks, high-end trick wheels such as Bones, Ricta, or OJ, and Bones Reds bearings to keep your wheels rolling longer and smoother.